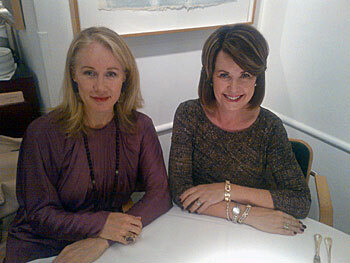 When LAK PR CEO Lisa Linden suggested we get together, I knew we’d have plenty to talk about. Pauline’s CV reads like a ‘How to Succeed in Business’ primer. Prior to joining HBS this year, she had a very successful track record in the luxury market, most recently at LVMH, (comprised of Moët, Hennessy and Louis Vuitton), where she was responsible for 70 brands including fashion, fragrance, cosmetics, watches and jewelry, as well as wines and spirits and selective retailing. She also sat on the board of L Capital, a private equity fund backed by LVMH, was a managing director at the private equity firm The Carlyle Group, and held senior positions at Avon and The Estée Lauder Companies. Pauline arrived at noon on the dot looking every inch the luxury maven. She was, of course, impeccably dressed, enveloped in a camel Rochas coat and carrying a similarly hued Marc Jacobs handbag. My mother always told me you can tell a lot about a woman by the way she accessorizes — and Pauline’s carefully curated accouterments from Hermès, Dior, Urban Zen and a dazzling Fred ring with a huge removable stone — spoke volumes. This is a woman who knows about the power of aesthetics. The idea for the Aesthetics course was “spontaneous,” said Pauline. When she and HBS’ Frances Frei first began talking about the kind of course Pauline could teach, Ms. Frei encouraged Pauline to “go deep” in designing the type of class that would best leverage her experience. As a professor at HBS, Pauline commutes between Boston and Manhasset, N.Y., where she and her husband, Marshall Brown live with their two children. Fresh off her last class of her first semester, she has already committed to teaching The Business of Aesthetics “into 2017 and possibly beyond.” Due to high demand, the school has added a second section of the course for next year’s MBA students. Using materials from a wide variety of resources, including an article from Wired about Disney’s Imagineering labs, which served as basis of exploring “the happiness halo” (More on that later) as well chapters from two books, The Substance of Style and The Experience Economy, Pauline was thrilled by her students’ level of “engagement and openness to a new curriculum.” Students also studied “iconic leadership models” including Steve Jobs, Ben Cohen of Ben & Jerry’s and Starbucks’ CEO Howard Schultz (“He went away for eight years and the business was tanking. Now he’s back and the business is back on track.”) Pauline also required student to watch the online TED talk, Designing for Trust, which explored how the visual elements of a brand, most notably a logo, is essential in developing consumer confidence.